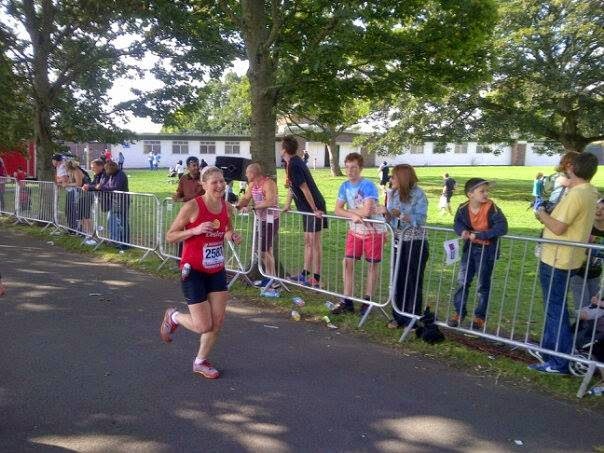 On Sunday 21st September 2014 I ran in the English Half Marathon in Warrington. I had waited a long time for this race as it was a place I had deferred from last year due to injury! However, I really wasn't in the mood for running and very nearly abandoned the idea completely! Thankfully I gave myself a stern talking to and did run! I was exceptionally tired as the day before the race I had taken my daughter down to Reading University which is a 500 mile round trip which came after several hectic evenings helping her pack all her worldly goods as well as working and marathon training! After a late night the previous night I wanted to cry when my alarm went off at 6am! I felt absolutely exhausted but forced myself out of bed, got dressed in my running gear straight away before I changed my mind and had porridge for breakfast! 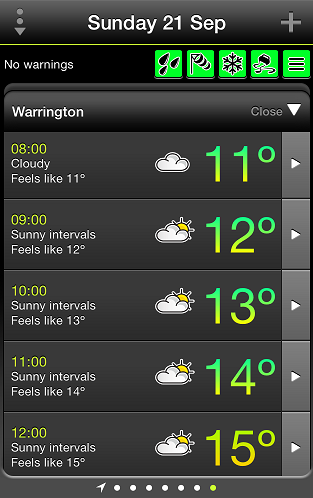 We left the house at around 6.45am for the 75 mile journey down to the race in Warrington. I was so tired I dozed on and off during the journey (luckily I wasn't driving!) and we arrived in the designated race car park not long after 8 O'clock! Luckily it was a multistory so we had no problem finding a parking space. We were greeted in Warrington with beautiful blue skies and warm temperatures for what was to be an excellent day for a half-marathon. It was about a 15 minute walk from the carpark to the race Head Quarters and the start line which were situated in Victoria park. It was a good job there were plenty of other runners heading our way as it wasn't clearly signed and not being local we didn't have a clue where we were going! When we arrived in the park I joined the long toilet queue, before heading to claim my place at the start! Thankfully this was a chipped event so being near the front wasn't important! I slotted into the '1 hour 45 Min's to 2 hour' estimated finishing time starting zone at around 8.45am ready for the 9am start. At around 9.50am a lady with a very annoying and shouty voice came over the very loud loudspeaker to do a warm up! She was so loud that a runner actually turned the loud speaker around so we couldn't hear her quite as much! Half way through the warm-up she abruptly stopped her routine and an announcement was made that the start of the race was going to be delayed by around 20 minutes! Everyone then sauntered away from the starting line! Although it was a lovely bright sunny day it was still chilly at this time of the morning and as everyone had got rid of their outer garments it was a little annoying for everyone to end up cold due to the delay! Luckily I bumped into a running friend so the time soon passed before we started round 2 of the warm-up! However, our "starting zone" was so crowded I could barely do toe taps without risking doing knee lifts or arm stretches! I don't think I have ever experienced such a crowded start in any of the races I have run in to date and was relieved when we started running at around 9.15am, some 15 minutes late! I think one of the main problems was it was a joint start for both a 10K and a Half Marathon run which followed the same route for the first 2 miles or so before splitting! I think it would have been preferable to have set the Half Marathoners off first and then have a separate start 10 minutes or so later for the 10K runners. However once we got running it wasn't too bad. Unfortunately, I felt really uncomfortable for the first couple of miles as my legs felt heavy and my ankles felt really stiff! I was worried something was going to "ping" on me as my ankles didn't feel right at all! Perhaps it was with sitting in the same position in the car for most of the day the day before or maybe I had just got too cold as once I got warmed up they seemed to loosen up! We set off on the roads leading away from Victoria Park and the city centre. The route overall rises in the first half of the race, and we were soon running besides canals and out into the countryside south of Warrington, which made it a nice race for the scenery. The race directors at the start had said that when the route split the 10K runners would go left and the half marathoners would go right so I purposefully kept to the right side of the pack so that I wouldn't miss the split! There was a Marshall at the said split shepherding people in the right direction but they must have missed a couple of escapee 10K-ers as about half a mile further on I saw them running back! I felt so sorry for them - it was like the run of shame! By now the sun was shining brightly and it was heating up nicely! The first water station was well signed in advance and came at around 3 miles serving water in bottles with sports caps! The route was mainly on closed or partially closed country roads or through parks so it was fairly scenic and a nice route with good support as we passed through the villages. My only grumble would be that going through the park the paths were very narrow so passing people became tricky and resulted in enforced slow going! The first part of the course had a couple of long slight uphill sections but mainly it was flat with some good downhill sections too! The water station at mile 6 confused me as they had screw cap bottles rather than sports lids like the previous station but it was a hot day so I didn't mind getting the wetting I got whilst trying to run and drink! However, at the following water stations it was back to sports cap bottles! I didn't stress too much about pace as I knew a PB wasn't on the cards! However, as I entered the park and headed towards the finish I tried to increase my speed slightly but my ankles felt slightly sore! I was dismayed when I realised that I had to do a circuit of the athletics track before getting to the finish! I wasn't very impressed! I hate long runs that end up on a track - it is so soul destroying when your legs are like lead and you have to make it right the way round the track before finishing! It seems so close yet so far! As I approached the finish line the commentator was announcing the names of those finishing and my name was read out! I felt like a proper athlete. No sooner had I crossed the finish line and I got a text message through confirming my finishing time as 1:54:32, which is an average 8.42 minute mile and my second best Half Marathon time so I am happy with that considering how I felt beforehand! Once I had crossed the finish line I was immediately handed my medal but then I had to join a long queue to get my other goodies and exit! 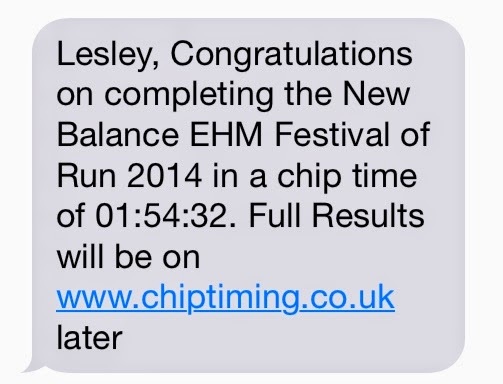 I think it must have taken me about 20 minutes to get reunited with my husband, after finishing! We queued and walked between tables collecting different things at each table including a T shirt, pair of running socks, energy gel, cereal bar, crisps, banana, Haribo's and water, then I had to juggle with everything as there wasn't any bags! It would have made much more sense and would have been quicker to bag it all up beforehand and just hand each runner a bag! After saying this I am not complaining as I don't think I have ever received so many goodies at a race before! So would I do this race again? Most definitely YES! It was a very enjoyable run with some great scenery and friendly Marshall's! You can view the route here. After leaving the park I then had a 15 minute walk back to the car - good to loosen up if nothing else! 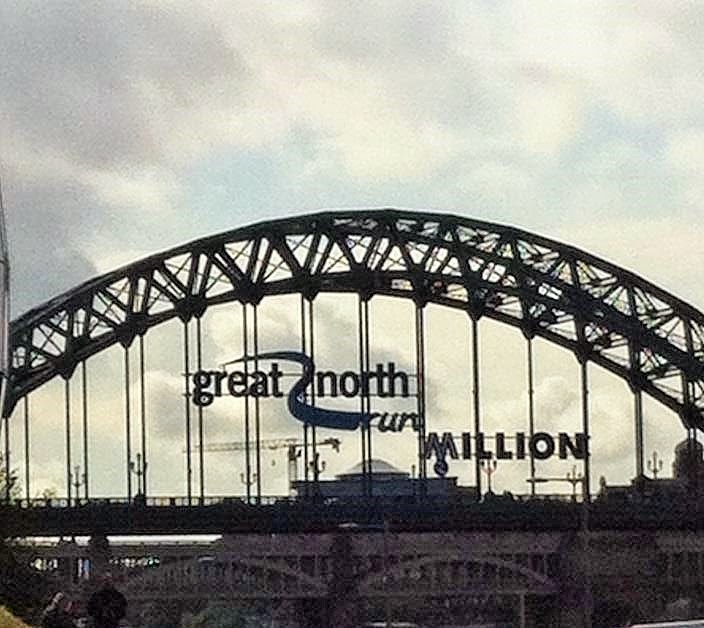 On Sunday the 8th September I ran in the 34th Great North Run, which was my third time in this event. 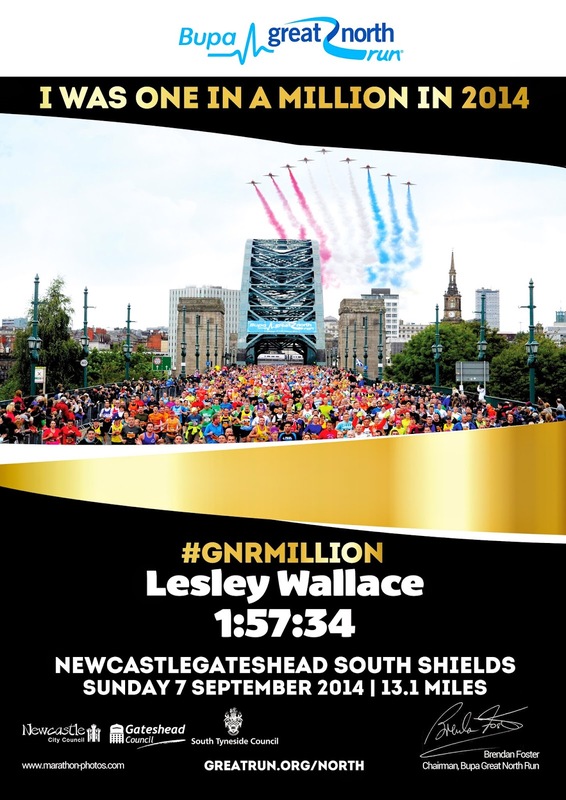 The race is the only one of it's kind that has attracted one million runners since starting in 1981, so the organisers were making a big thing of who would be the millionth finisher. None of the runners knew whether the millionth finisher would come early or late in the race so it was just a case of run and see if you were the lucky one! I was woken by my alarm at 6.15am and I was pleased to be greeted by a bright sunny day! I had my usual pre-race breakfast of porridge and a coffee before getting changed into my running gear. I attached my race number to the front of my vest top and my "I run 4 Haddie" message on the back. I then secured my timing chip to my shoe lace before putting them on! Each runner is issued with an electronic timing tag that attaches to their trainer. The tag is triggered as you cross the start and finish lines, giving an individual and accurate finishing time as well as the split times you pass certain timing mats en route such as at the 5K, 10K, 20K points. We left our home in Kendal at 7am for the 100 mile journey to Newcastle. It was fairly foggy going over the moors but the traffic flowed nicely and I was dropped off near the start line by my husband at around 9am for the 10.45am start! I had to be dropped off early to enable my husband to drive to the finish and park before the surrounding roads were closed for the race! On arrival in Newcastle I was pleased to see that the sun was still shining although it was very chilly! I was pleased that I had worn an old hoodie (donated by my son) to keep me warm which I was planning on discarding at the start line. I queued for the toilets for about 15 minutes before wandering to the starting pens. 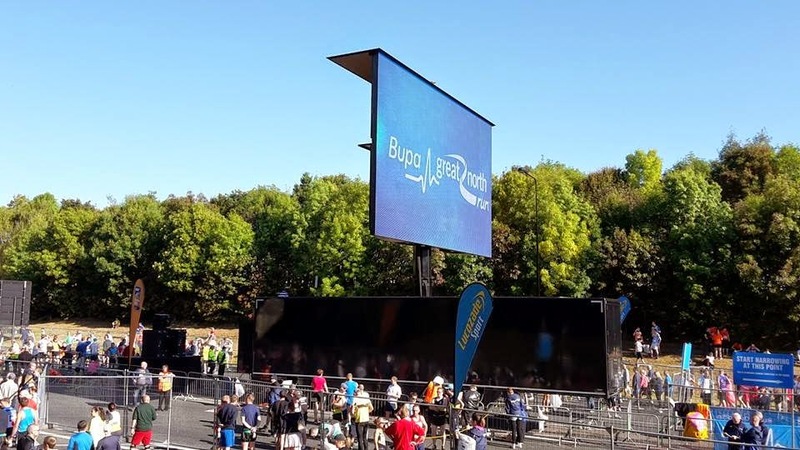 By the time I had had a look around and watched a few of the celebrity runners being interviewed it was around 10am when I got to the white zone pen I was in. I sat on the banking of the dual carriageway in the sunshine eating my banana people watching before actually going into my pen at around 10.15am. I entered the white zone pen E and moved as close to the front of it as I could. I had a quick look around for any familiar faces and was amazed to see a bloke standing right next to me who I had met in February at The Barcelona Half Marathon! What a small world it is in the running world! After chatting with him and watching the elite and wheelchair competitors start on the big screen it was time for us to warm-up. Our communal warm-up was conducted by a Mr Motivator type guru who we followed on the big screen. All warmed up and we were ready to go! I discarded my hoodie over the barrier at this point. All the discarded clothes were later collected and donated to charity. There was loads of things so I am sure the local charities will be delighted! There was a chorus of Good Lucks between runners as the starting gun fired! The atmosphere was electric as we shuffled towards the start! It took about 15 minutes before it was our turn to go over the starting mat, thank god for the timing chip! I was on the left hand side of the dual carriageway which meant I headed downhill to go underneath the underpass where there was the usual chorus of "Oggy Oggy Oggy!" which never fails to make me laugh! Just as I was emerging from the underpass I saw the red arrows fly over! I am so pleased I didn't miss them or I would have been bitterly disappointed! I had decided to attempt to do a positive split race meaning I wanted to set off slowly and get faster each mile. However, with the excitement of the race and the downhill nature of the first couple of miles this strategy totally went out the window with me completing my first mile in a 8.14 minute mile pace! I passed the first walker at 1.5 miles which really irritated me as that person must have set off in a "fast zone" knowing he wouldn't be able to maintain the pace and was a obstacle to other runners. With it being such a hot morning the first water station was much appreciated at around mile 3! I took this opportunity to have a slurp from my gel flask to maintain my energy levels. However, I can't have put it back in its holder properly as not very far up the road it dropped out! Luckily I heard it land and caused total chaos whilst I stopped to pick it up! I bet I was cursed by several runners at this point but I knew I couldn't survive the rest of the race without it! Rather than risk it falling out again I put it in my little bum bag where I knew it would be safe and secure! Running through the area around the water station was very tricky as there were hundreds of bottles littering the roads where people had just dropped them! Some were fairly full of water still so if you kicked one it really took off! I don't understand why people can't be more thoughtful and dispose of the bottles at the side of the road! At other races I have done large skips have been located just past water stations for runners to dispose of bottles safely which is a much better idea! Along the entire route the streets were lined with hoards of spectators and children high fiving,which I really enjoyed! I was totally in the carnival spirit this year enjoying all the bands and the atmosphere immensely. There was plenty of Haribo's and Jelly Babies on offer by the locals and even ice pops and Beer would you believe! However, I managed to refrain! I'm not quite sure how my stomach would react to running on beer! As well as the 2 "official" shower stations there was lots of locals cooling us down with hose pipes which was much appreciated being such a hot day! The only thing I didn't appreciate was the kids squirting water bottles as we went passed! I wanted cooled down not drowned! The route seemed more congested than I remember in previous years and it was difficult to maintain an even pace. It was a case of speeding up when the coast was clear and slowing down at other times. Going around the roundabouts and up the hills were the most difficult to navigate as I was reduced to a shuffle trying to zig zag in and out of walking runners! After the course climbed slightly there was another water station at around mile 6 and I took another slug of my gel. I was still feeling very relaxed at this stage and wasn't too concerned about my time! I was more interested about having a good time rather than doing a good time! Just before the 10 mile mark I took my remaining gel and still felt like I had plenty to give! There was a hill at around the 11 mile mark, then a nice steep downhill section leading down to the seafront and the final mile! Here the crowd support was amazing which really spurred me on! I quickly glanced at my Garmin and realised that although I wasn't on target for a PB I could still get a course PB if I kept the pace up! As I had my name splattered over the front of my vest I was surrounded by spectators spurring me on by shouting my name! I hadn't realised that one of them was my husband until the last minute! I could see the finishing arch in the distance and tried to put one last burst on! I was delighted to finish after a thoroughly enjoyable race and although I didn't pace it as I had planned I seemed to pace it well and finished feeling good! I stopped my Garmin and was pleased to see I had indeed managed to get a course PB finishing in 1:57:37. Beating my previous GNR times of 1.59.46 and 2.21.49! My Garmin stats can be seen here! The official time was 3 seconds faster at 1.57.34! I had my timing chip removed by a friendly Marshall then made my way to collect a bottle of water and a goody bag containing a T shirt and the all important bling as well as a Lucozade drink, some sweets and a oat bar! I slowly made my way through the crowds and had to queue to get into the family reunion area! Eventually I made it to the place I had arranged to meet my husband and we found a nice quiet piece of grass in the sun to relax in. At this point I was starving and devoured a sausage roll and a bag of crisps, followed by a chocolate bar! What better way to refuel? Whilst we were eating lunch the one millionth finisher crossed the line! How exciting it must have been for her! After recovering we made our way to the car which was parked about 3/4 of a mile away. All in all a thoroughly enjoyable race, with a brilliant atmosphere which was well organised. My only complaint would be the cost of the official photos. I think £17.99 for ONE digital download is a total rip off! It's a good job I took my own photographer with me! He got some great photo's of Mo Farah too! 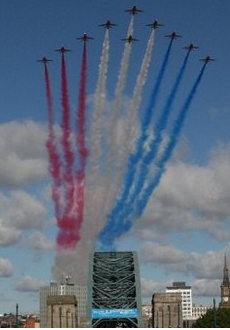 I Had announced before this race that this was my third and final Great North Run! It is a very expensive race to enter and having run it 3 times I felt like I had "done" it! However, after having such a great day and loving every minute I am desperate to run it again! I will have to let the ballot decide!